The second challenge in the Tapestry Ravelry WAL is a complementary color tapestry. I know nearly nothing about color, and so it’s been very educational. Of course, I didn’t pick subtle, soothing color combinations… just the eye-sizzling ones! That blue water is very loud. I’m using my C. Cactus Flower Mini… upside down. Oops! 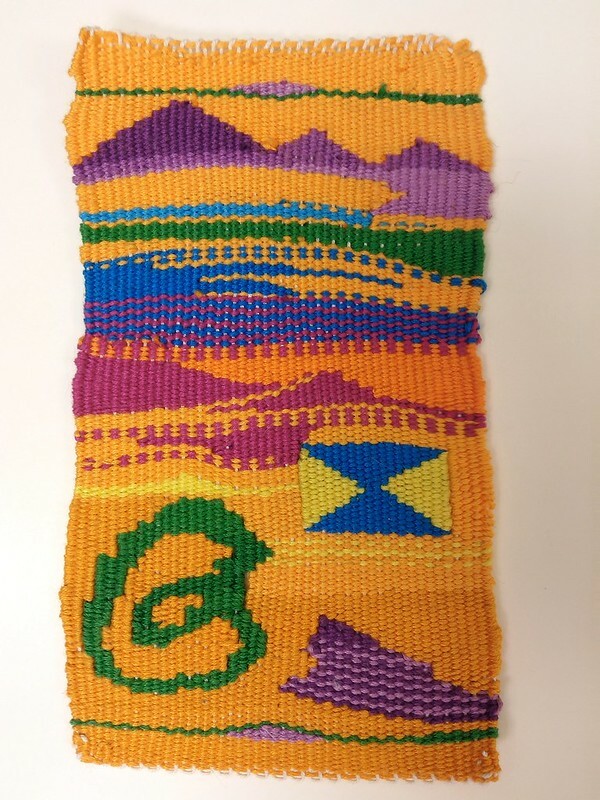 It was a mistake, but I don’t think there’s any real difference with the weaving. 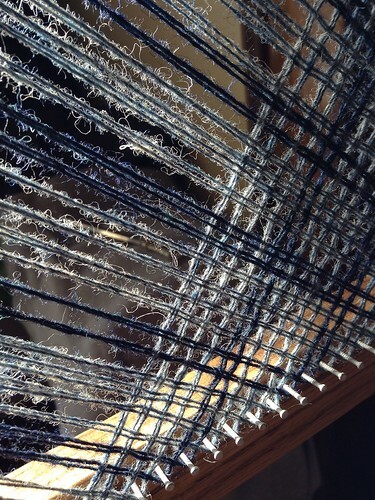 Ergonomically, it’s easier to weave with the bottom bar on your lap. I’m using a tatting shuttle here and there, but I wouldn’t recommend it. It catches on the warp threads. 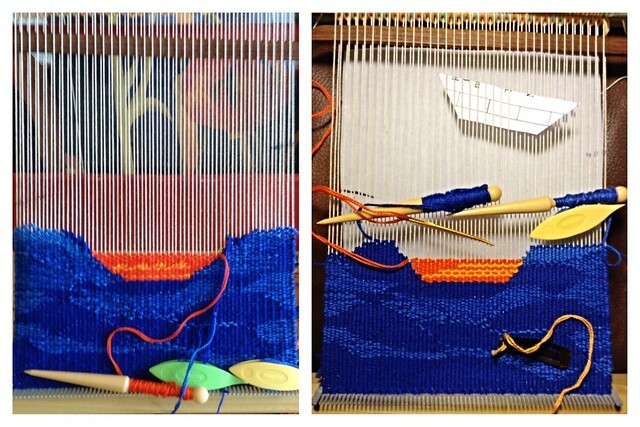 The tapestry will end up being about 7.5″ x 11″. More water. I’m totally experimenting with this, using a dark blue cotton embroidery thread and a lighter blue. The complementary color to blue directly across the color wheel is orange. Get ready for an orange boat! The boat started out a little shaky. I had framed it on either side with too much muddy-looking water, and I didn’t care for the angle of the boat. This design is very geometric, and so I unwove the top section and started over. The “old” one is on the left, and the “new” one is on the right. Are your eyes bugging out yet? Sorry about that. 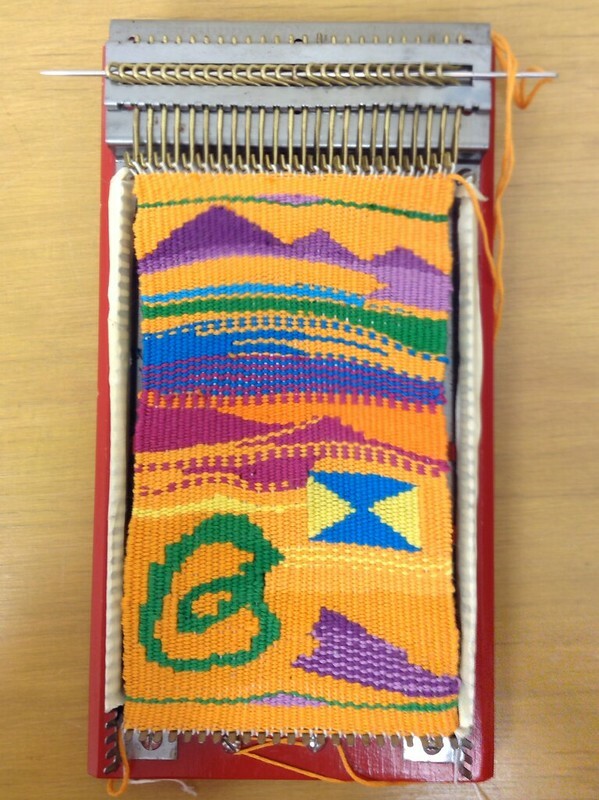 It only took me about ten months to finish this 4″x6″ weaving. 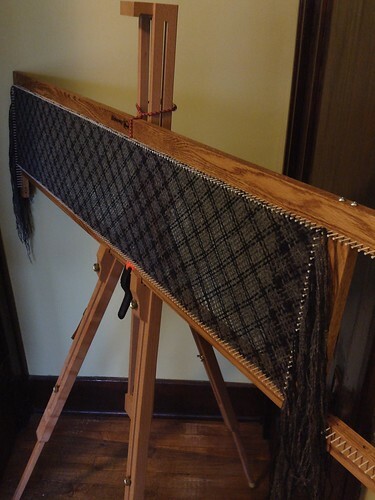 Honestly, the Lightning Weaver is an awesome loom and I’ve used it for several small tapestries, but quite awhile ago, I wished I hadn’t started this type of a project on it. 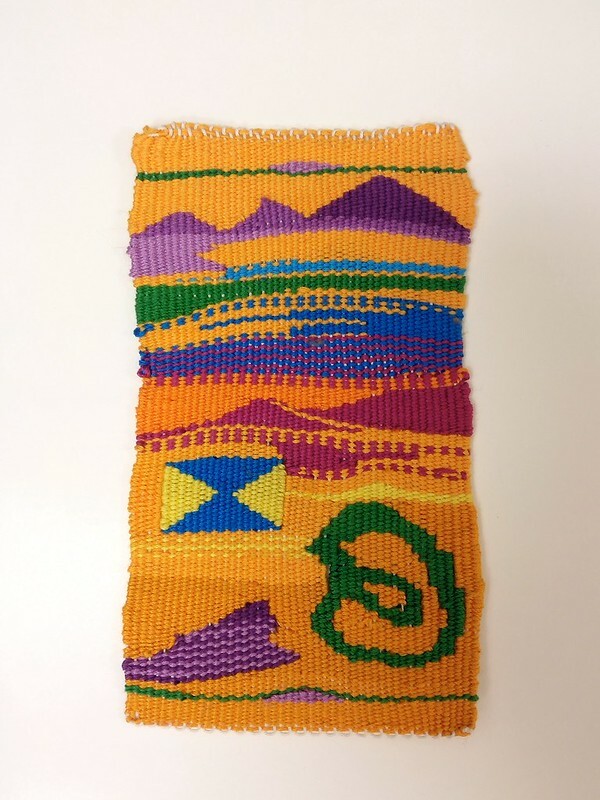 I used embroidery thread and needles to weave it. At 12 epi, it was pretty fine. My goal when I began was to work in more curves and colors. You can tell I jumped into “finish” mode where the lines start traveling from selvedge to selvedge. I went back to shapes near the end. The Lightning Weaver has little hooks on either end, which makes it impossible to weave up until the edge. So, I’m left with some white threads poking out, but that’s okay. 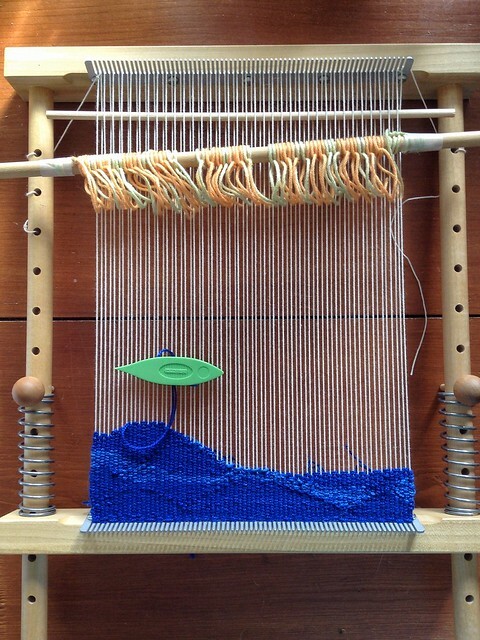 Throughout the weaving, I overlapped where I started and stopped threads. This keeps the back very tidy. Any loose threads can be safely trimmed away. The yarn was a challenge (Schachenmayr Original Boston Sun (Earth Mix)). I’m making a note because I chose, on purpose, a yarn I wouldn’t have chosen. 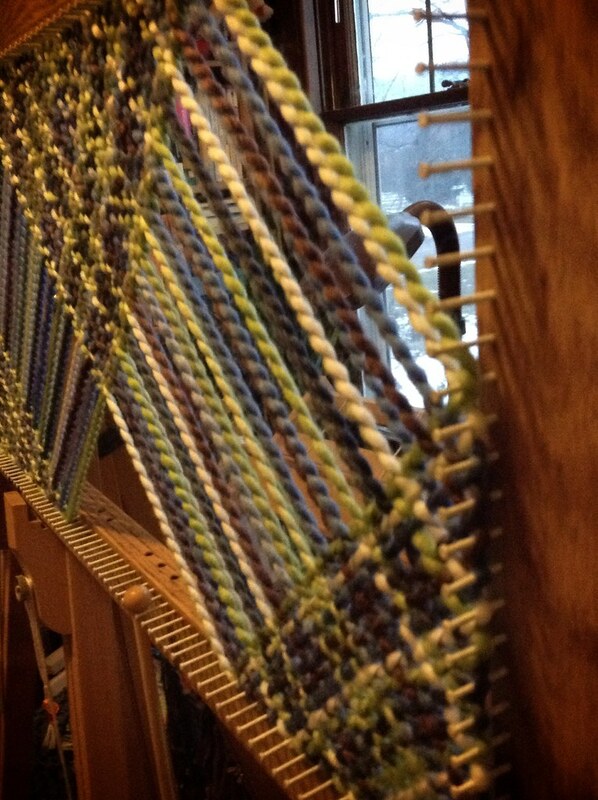 I wanted to see what the colors would look like on the loom. Believe me, the orange is a blaze hunting orange, but it looks far softer in the photo. The bigger issue was that the yarn itself was snaggy. It split and frayed and pretty much made the project difficult to complete. I think it’s better for knitting. 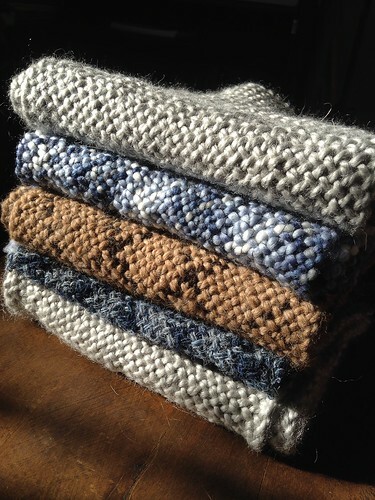 This one looks like it wants to jump off the loom and wrap itself around your neck… is that good or bad? 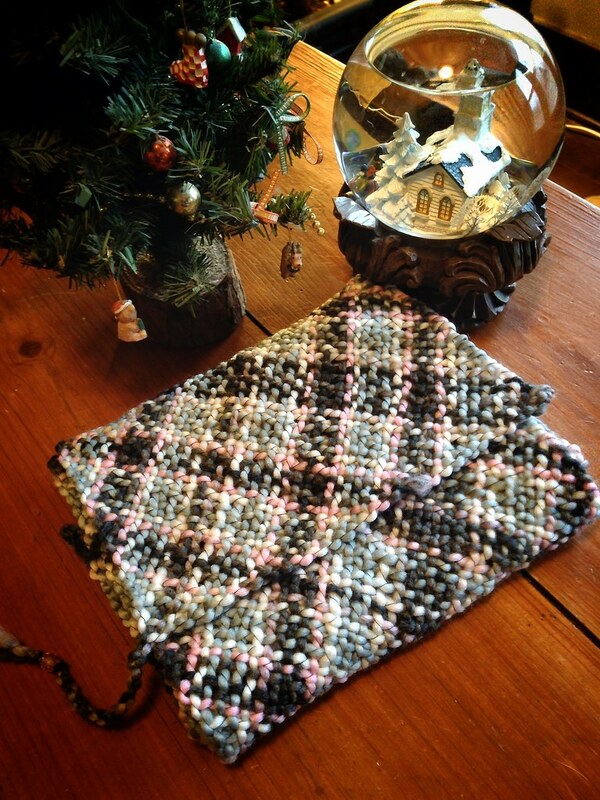 The yarn is polyester, and the plaid pattern happens because it’s multi-colored. This is my idea of fun. I liked the first one so much, I decided to weave another. You could say I’m enjoying my new Hideaway Homestead rectangle loom. 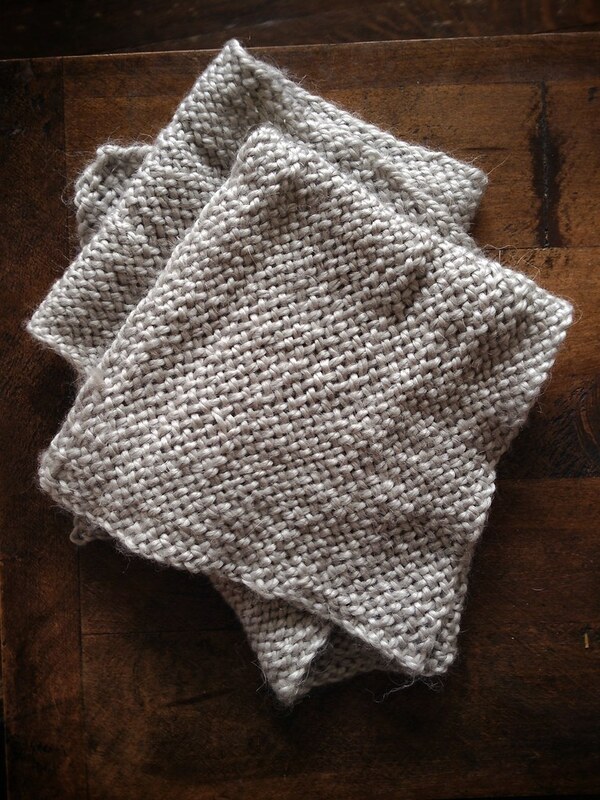 This rectangle loom scarf was super fun to weave. I’m on a roll. Alpaca and merino from Wisconsin Driftless Alpacas. 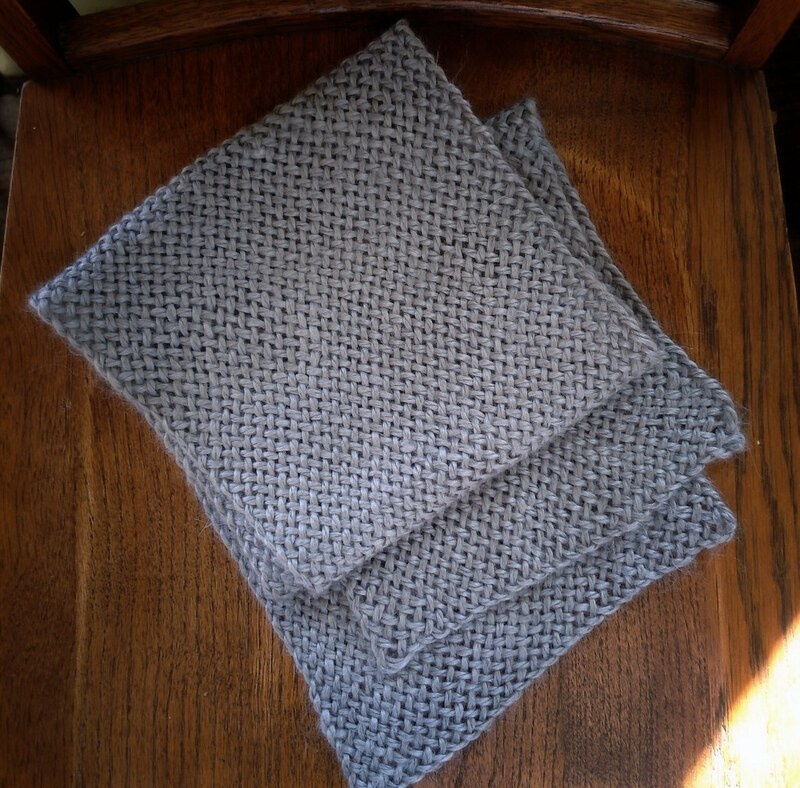 I used my rectangle loom for this, the third scarf, and I haven’t set it to any other sizes yet. I’m reminding myself it’s an experiment. This yarn, which I didn’t sample, became super scratchy and wavy once washed and dried. It has a look that I like, but the feel is all wrong. It’s a perfect scarf–for a snowman. 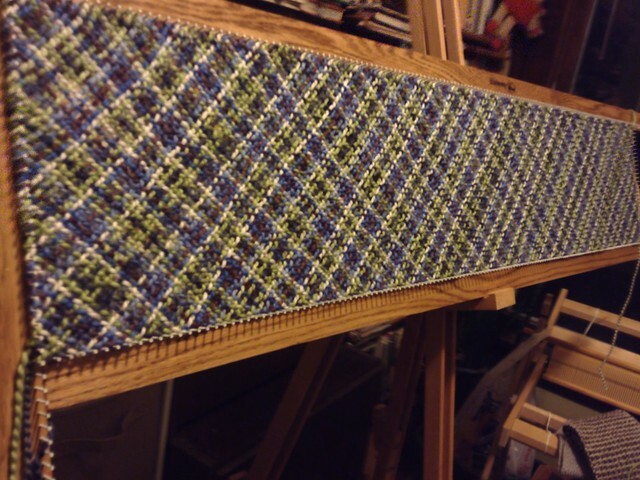 A second rectangle loom scarf on the Hideaway Homestead loom. 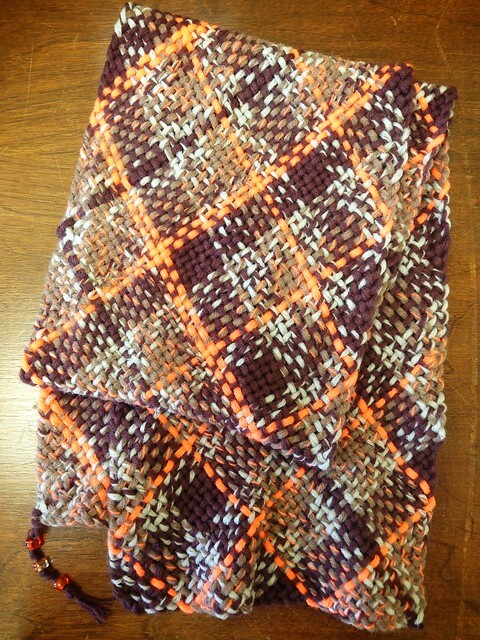 This one is an experiment with double-stranded fine wool and a plaid pattern. 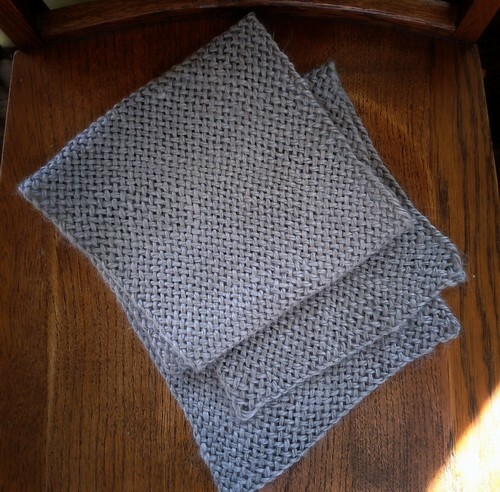 I love this simple, soft, silvery scarf, woven on my new Hideaway Homestead rectangle loom. 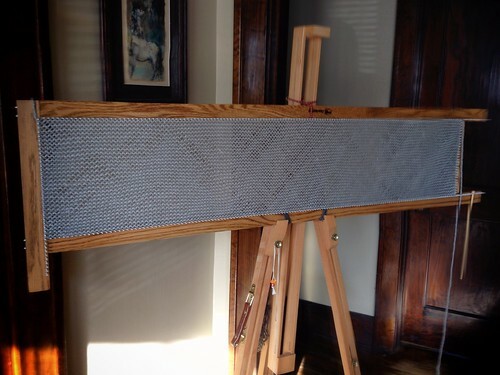 Having woven several projects on triangle looms and Weave-Its, I had some experience with continuous strand weaving, but I’d never used a rectangle before, which is all done on the diagonal. Triangle loom weaving is more popular, and you can find several yardage charts available, but not so with the more obscure rectangle. So, I found this explanation on Roger Thrush’s website about how to estimate yardage (page 12). Multiply the number of pegs of the width by the number of pegs of the length and divide by 36. Now, you find the square root of 181, which is approximately 13.4. So, the hypotenuse is 13.4″ long. 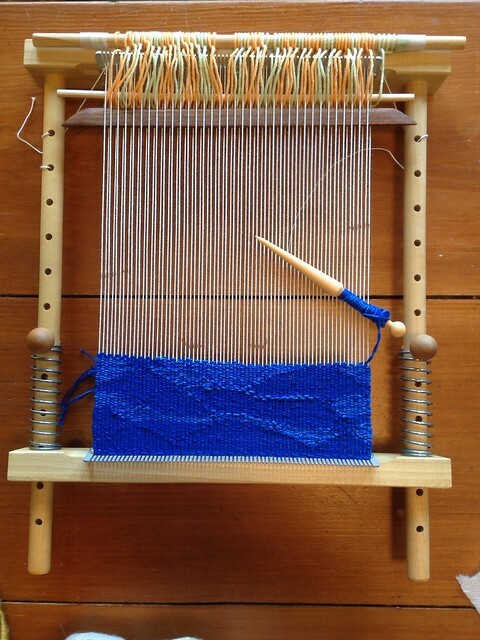 However, when you weave, there’s something called “take up,” which means you need to add in more yardage than you think because all those threads are going over and under other threads, using up about 5-15% more than your total. If I had needed an extra 10% for this project, I wouldn’t have had enough yarn. The skein of yarn stated on the package that it had 120 yards. So, either I didn’t have much take up, the yarn company added in a few extra yards, or there was magic in the air, because I not only had enough yarn to finish this project, I had about one yard to spare. Weird! 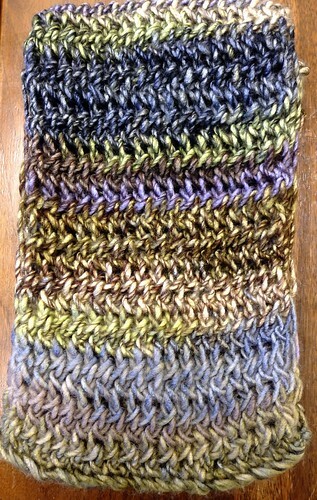 It was super fun weaving this scarf. I really love bias weaving. It’s very stretchy and comfortable. 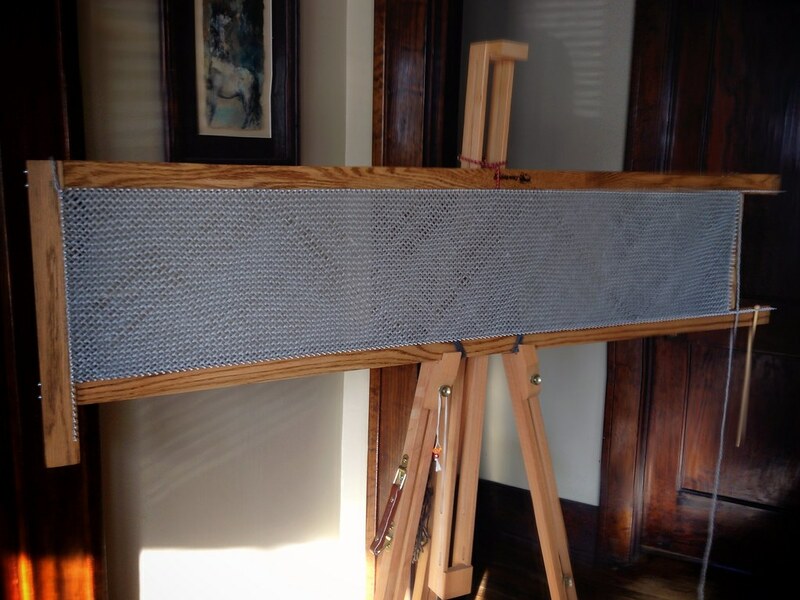 The look is more toward the rustic end of the weaving scale, but the feel is really kind of luxurious. As for the loom, I can’t believe I waited to buy this. It really feels like something I should have been weaving on for a few years now. Roger from Hideaway Homestead (website | Etsy) is great. He makes a fine loom and is super efficient when it comes to getting it to your door. I’ll be using this loom quite a bit.